Every year, rabbit producers around the world raise and kill 1.2 billion rabbits (200 million tons of meat) in shocking conditions. While the rest of the “livestock” industry has transitioned to massive factory farms, the rabbit industry has long been an exception—most rabbit meat producers and processors in the United States, for example, have been small, backyard operations. However, this is beginning to change, both in the United States, and, especially, internationally, as massive rabbit “production” operations are proliferating in order to meet a new demand for rabbit meat. While rabbit meat was not super popular in the United States (thanks to the rabbit’s status as both a pet and a beloved cultural icon), except among the poor and rural, foodies and rabbit producers have been promoting rabbit meat as a low fat and even “green” meat source. According to the USDA, rabbit meat consumption in the United States was .02 pounds in 2000—in other words, every American ate .02 pounds of rabbit for the entire year. Those rabbits came from 4,300 producers. In 2007, when the USDA did their last survey of the industry, those numbers went up—6,800 farms now sold 980,000 rabbits per year, not counting those produced and killed for personal consumption. Outside of the United States, production is also up—way up. Italy, France, Venezuela, North Korea, Egypt, Spain, and China are the countries that produce the greatest number of rabbits for the meat industry, with China both producing the most rabbits (690,000 tons per year, or 40% of the total, as of 2010), as well as exporting the greatest numbers—10,000 tons of carcasses (sent primarily to Belgium, Germany, and the United States). The European Union alone produces and slaughters 326 million rabbits per year. China, Malta, Italy, Cyprus and France are the biggest consumers of rabbit meat. On top of these major producers and consumers, international organizations have been promoting rabbit meat as the solution to many third world countries’ economic problems, with the result being that Africa, Caribbean, and Middle Eastern countries are now increasing their rabbit production on small family farms. The life of a rabbit fated for dinner is short and bleak. Rabbits are raised in small wire cages which are rarely cleaned; videos and photos from production facilities around the world show rabbits living directly in or over their feces and urine. Producers wean baby rabbits as early as four weeks so that their mother can be bred again quickly. Breeders house the babies together in small cages, often about 24 inches by 30 inches, affording each rabbit about 120 square inches—about the same amount of floor space as a sheet of legal-sized paper—in which to live out their entire two-to-three month lives. Conditions become more cramped as the rabbits grow, and they cannot run, exercise, jump, or play. Breeding males and females live in solitary cages until they are not as productive, and then they too are slaughtered. In the EU, 10,000 to 20,000 rabbits are kept in large production sheds—numbers that look an awful lot like other factory farmed animals. The result of these abusive conditions? Besides the suffering of the animals, the farms have to give them huge amounts of antibiotics during their short lifetimes, just to keep them alive until slaughter. Most producers ship rabbits via truck to slaughter. Since there are only about fifty-five rabbit slaughterhouses in the United States, rabbits often endure truck rides that are several hundred miles to destinations several states away. Others are slaughtered right at the production facility, which is typical in other countries, for example. In the United States, since the US government does not consider rabbits “livestock”—they fall under the jurisdiction of the Food and Drug Administration—they are excluded from the Humane Methods of Slaughter Act’s protection. This means rabbits completely lack any sort of legal protection from even the most barbaric abuses throughout their entire lives and slaughter. In other countries, rabbits have even less protection. While many processors, especially in the EU, attempt to stun rabbits before slaughter, these methods are frequently ineffective and inhumane. In the US, processors may stun up to one hundred rabbits an hour by pulling down on their heads while pulling back on their hindquarters, a technique called “cervical dislocation.” However, this method is only effective if the rabbits are less than 2.2 pounds, and by the time they reach the slaughterhouse, rabbits can weigh between 4 and 8.5 pounds. Other processors may stun rabbits by shooting them with captive-bolt guns. In the EU, in large industrial settings, stunning is typically done with a V-shaped device with electrodes on the end that shoots electrical current into a rabbit’s head. Backyard producers who do their own slaughtering may simply decapitate them, shoot them with pellet guns or .22s, or stand on broom handles laid across the rabbits’ necks. Finally, either after stunning or without any stunning at all, rabbits are killed by hanging them up by their back legs and slitting their throats until they bleed out—often conscious at the time. One of the reasons why rabbits are so popular to raise as meat animals today is that the US government and international groups overseas have been promoting them as cheap and easy to raise. The Penn State College of Agricultural Sciences promotes rabbit meat, and suggests that the costs to raise the rabbits are minimal: just $840 for 40 breeding rabbits, plus another few thousand dollars for cages, and just 150-200 hours of (human) labor per year. That means that the recommendation is that one’s rabbits only get dealt with by humans for about a half hour per day. In the past year, there have been a number of exposes which have highlighted the conditions under which rabbits live and die in the meat industry. In the United States, Last Chance for Animals, a Los-Angeles based animal rights group, conducted an investigation at Pel-Freez, the US’s largest rabbit meat producer, and saw workers brutally abusing the rabbits. Unfortunately, no charges against the workers or the company have been filed because of the lack of protection that US laws offer for rabbits. Overseas, Compassion in World Farming, a British animal rights organization, went undercover to visit 16 rabbit factory farms in 5 countries – Italy, Greece, Czech Republic, Poland and Cyprus. The investigators found rabbits injured from living in filthy, tiny wire cages, dead rabbits left around live rabbits, mounds of feces underneath the cages, and breeding rabbits only leaving their cages to be artificially inseminated, and then, to be slaughtered. For rabbit lovers, the knowledge that our beloved companions (as rabbits raised for meat are the exact rabbits who we have as pets) are being raised and slaughtered in such cruel conditions is heart-rending. But for animal lovers in general, most of whom eat meat, if they knew the reality of the lives and deaths of the millions of rabbits who are killed for what some are calling “the new white meat,” they would most likely never eat rabbit again. Unfortunately, while information about this is available on the Internet, the rabbit industry (and the government agencies that support it) work as hard as they can to conceal this information from the public. The result is more suffering for more rabbits. What can we do? If you love rabbits, or even love animals and don’t want to see them suffer, please educate your friends, family and colleagues about this issue. 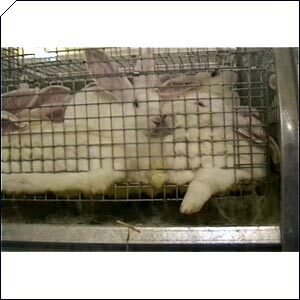 Rabbits don’t deserve this kind of cruelty. No one does.